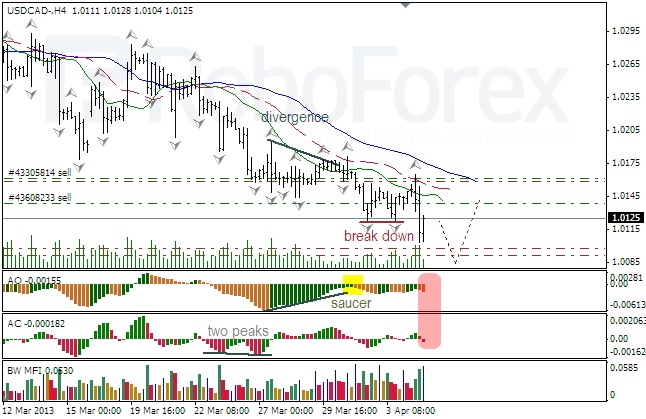 At the H4 chart of the USD/CAD currency pair the Alligator continues moving downwards; the teeth stopped a bullish fractal, the price is forming a bearish one. The indicators are in the red zone; there are several Green bars and might be a Squat one on the MFI. I opened the second sell order; a protective stop on the first one has already been moved into the black. A bearish fractal may reach Take Profit levels. At the H1 chart of the USD/CAD currency pair the Alligator woke up in a downward direction. The price formed a bearish fractal; AO and AC indicators are in the green zone; there might be several Squat bars on the MFI. The jaw will stop a bullish fractal. At the H4 chart of the NZD/USD currency pair the Alligator’s mouth is going to sleep. The price is forming a new bullish fractal, which may reach Take Profit, but AO and AC indicators are in the grey zone so far; there is a Fade bar on the MFI. I’m keeping my long position opened with the stop placed below the Alligator’s mouth. At the H1 chart of the NZD/USD currency pair the Alligator is consolidating. The indicators are in the green zone; there is a Fade bar on the MFI. The price is forming a bearish fractal and may later reach Take Profit.